Welcome to illiniDMD.com, the official website of Dr. David Hyten, DMD. We perform general dentistry for all ages in Edwardsville, IL. Dr. David has practiced since 1998. Dr. Kenneth C Hyten, David's father, opened the practice in 1968. The office has been serving Edwardsville for nearly 45 years! Our newly renovated, state-of-the-art office boasts sattelite TV, Nitrous Oxide and commercial free music. Troy Road has seen many changes since we opened, but we still treat people one patient at a time. We have been treating many of our patients for generations, but we always have time to see emergencies and new patients. My dental team attended the Chicago Dental Society Midwinter Meeting. We learned about caring for patients with special needs. ALSO, we toured the convention floor to see what all the dental peddlers had to sell. Dr Dave visits with Donatello of the Teenage Mutant Ninja Turtles. We discussed how it is so very important to brush twice per day. Located in the newly renovated Hyten Professional Building, next to Qdoba on Troy Road (IL route 159). The state of the art facility has 6 operatories with a lot of natural light. Look for Dr. Dave on YOUTUBE. Below, you see a short video on replacing a single crown. 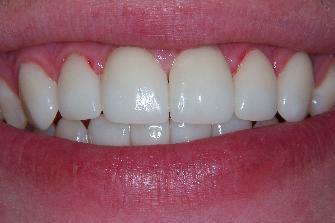 A previous crown was improved by replacing it with an All Porcelain crown. A more natural and cosmetic improvement! My family is growing and growing. Baby is talking up a storm. The twins have started 2nd grade. My oldest boy is now a 4th grader. Where does the time go! The twins are playing soccer for Gateway FC. All three boys are swimming for Edwardsville Breakers at the Y. 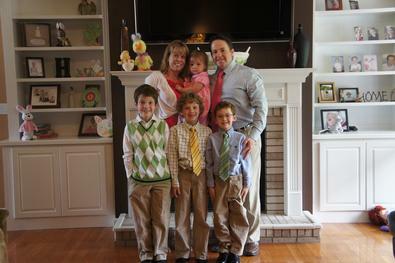 This picture was from Easter. These teeth were improved with veneers. No shots. Virtually no drilling! Patient was VERY satisfied.